Kicking off the Festival on Monday, April 8, Dr. Carey Campbell will present a lecture exploring the importance of Bach and his continued influence of music today. Local musicians will perform. 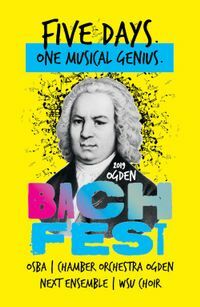 Bach Fest Schedule of Festival Events: Monday, April 8 at 7pm: Bach Lecture & Mini-Concert at Weber County Library by Dr. Carey Campbell Tuesday, April 9 at 7pm: Concert #1 at Holy Family Catholic Church with Chamber Orchestra Ogden Wednesday, April 10 at 3:30pm: Bach for Kids at Treehouse Museum Thursday, Apr 11 at 7pm: Concert #2 at St. Paul’s Lutheran with NEXT Ensemble Friday, April 12 at 7pm: Concert #3 at Ogden Tabernacle with WSU Choir All Concerts and Events are FREE and OPEN TO THE PUBLIC.